ech2o challenges the pupils to design a piece of kit or an advertising campaign that will reduce the amount of time people spend in the shower. Usually delivered as a double lesson. Chosen by one school as a full day workshop for Year 7 Design and Technology pupils as part of their term project. 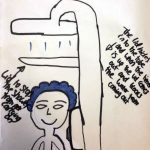 Take a look at some of the designs pupils created to encourage people to shower shorter here.